It seems that Alfa Romeo decided to remove all the camouflage on the open-top version of the 4C as two prototypes have been spotted on the streets. 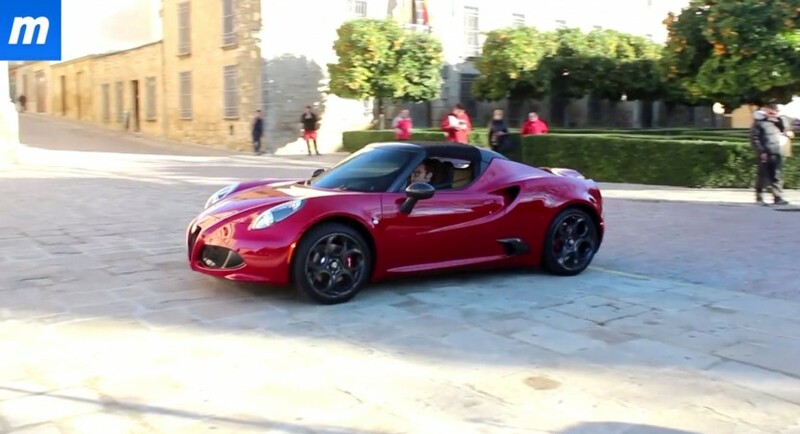 The company is actually filming a commercial for the new Alfa Romeo 4C Spider on the streets of Spain. With its debut set for the upcoming Geneva Motor Show in March, the new Alfa Romeo 4C Spider comes with little modifications, the main one being, of course, the retractable top. Revised headlights and some carbon fiber inserts will also set it apart from the standard 4C. Under the hood sits the standard 1.75-liter gasoline engine producing 240 horsepower and 350 Nm of torque for a 0-100 km/h sprint in about 4,5 seconds and a top speed of 258 km/h. Expect to see an official debut of the new Alfa Romeo 4C Spider in the coming months as the Geneva Motor Show is not very far away. Until then, be sure to check the footage above and also turn up your volume to hear the pleasant sound of the turbocharged engine.